Nanni Balestrini is an Italian experimental poet, author and visual artist of the Neoavanguardia movement. 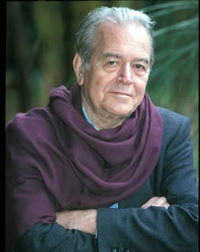 Nanni Balestrini is associated with the Italian writers movement Neoavanguardia. He wrote for the magazine Il Verri, co-directed Alfabeta and was one of the Italian writers publishing 1961 in the anthology I Novissimi. During the 1960s, the group was growing and becoming the Gruppo 63, Balestrini was the editor of their publications. From 1962 to 1972, he was working for Feltrinelli, cooperating with the Marsilio publishers and editing some issues of the Cooperativa Scrittori. Balestrini's political activities are also noteworthy: in 1968, he was co-founder of the group Potere operaio, in 1976 an important supporter of the Autonomia. In 1979, he was accused of membership in the guerilla and fled to Paris and later Germany. Balestrini got known by a larger public thanks to his first novel in the beginning of the 1970s We Want Everything. It describes the struggles and conflicts in the car factory of FIAT. In the following years, the social movements of his time continued to be his subject. With the book The Unseen, he created a literary monument for the "Generation of 1977". It shows the atmosphere of rapid social change during this years, concretising in house occupations, the creation of free radios and more, and also shows the considerable repression by the state of these movements. Other important works are I Furiosi, dedicated to the football supporters culture of the AC Milan, and The Editor, dealing with Giangiacomo Feltrinelli. Especially in his novel The Golden Horde, co-written with Primo Moroni, his proximity to operaism is obvious. His most recent novel Sandokan (2004) deals with the Camorra in Casal di Principe.